Just put the final touches on this massive project yesterday. I honestly didn't think it would get this big, but I went a little crazy with the recolors. I'm really happy with it. This is the fourth installment of my modular furniture set. 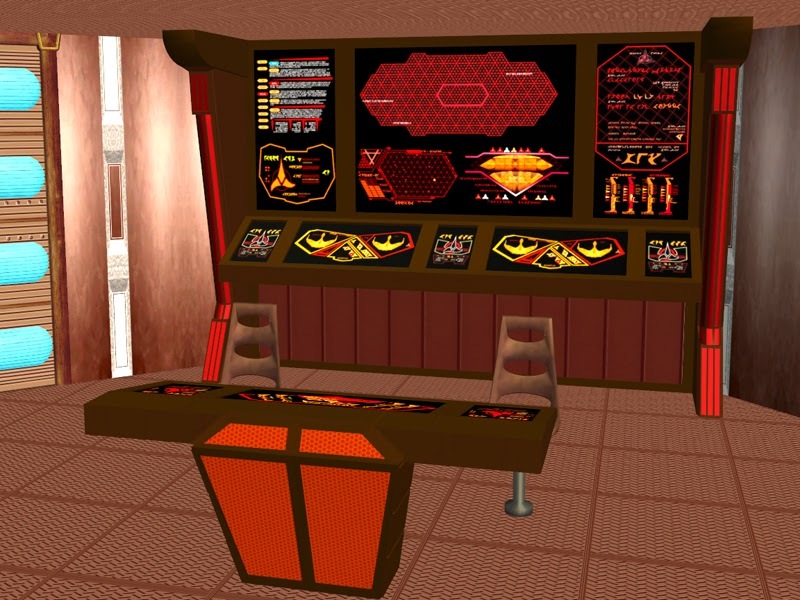 This one includes lots of cool bridge objects; enough to make the MSD (Master Systems Display, or alternately Master Situation Display, an interface located on the aft wall of the bridge on most starships, that displayed the status of the ship at a glance). There are also some components for making some basic bridge consoles. The set takes advantage of the repository technique for the base texture and wall panels, and I have included the MASTER OBJECTS ONLY (no recolors). Recolors for these objects can be found on the RECOLORS THREAD. With a few exceptions, most of the recolors are "anyships". They don't have class-specific textures and can be used interchangeably. The few exceptions are MSDs and engineering panels for various ship types. These are clearly labeled. Cardassian- Cardassian displays. There are two subfolders: Cardassian Cool Green (a deep green texture, reminiscent of some of my earlier Cardassian recolors) and Cardassian Cool Red (similar to Cool Green). Coatl- There are two subfolders: Coatl Alliance and Coatl Coalition. They have different aesthetics, and it took me a hella long time to recreate the Alliance colored plumes and display graphics. I'm no Dr. Michael Okuda, but I'm pretty proud of my work. For those who don't know, the Coatl are one of the principle races in Blue Heaven Stories. Galaxy- The good old Galaxy-class LCARS we know and love. There are even a few bonus panels for sickbays, observation lounges, and engineering. Galaxy Cool Blue- A few quick 'n dirty slider recolors of my Galaxy-class textures. Reminiscent of my Talon-class recolors. Icthian- Another race from Blue Heaven Stories. I think these came out pretty. Intrepid- A whole mess of Intrepid-class recolors (but perfect for Prometheus or Nova bridges as well). there are bonus recolors for sickbays, science labs, and observation lounges, too. Klingon- A mighty set of Klingon recolors. Sovereign- Cool new Sovereign-class textures; also perfect for Akira or Luna bridges. Includes bonus recolors for sickbays, observation lounges, etc. Veron- Yet a third race from Blue Heaven Stories. The Veron Graphics are trulu unique. As always, I've spent massive amounts of time playtesting this set. I tested each object individually, and hammered out all the kinks. As far as I've seen, there are no glitches and everything works exactly as it should as far as slave textures, joint alignment, placement, etc. Please report any issues. The focus of this set is to create realistic crew quarters, kitchens, bridges, etc. The furniture is designed to be stacked together, giving your sims' bridges, observation lounges, sickays, etc. a built-in look, for more realistic sets and backdrops. As I am more of a storyteller/ dollhouser than an actual player, my main focus was on how good the objects look in-game, but they have been thoroughly playtested and work well for players who focus on gameplay, too. Please read carefully: The single bed and data console from the crew quarters set provide the master textures for this entire set. As the repository technique is used, I have included the repository objects so you don't get flashing blue textures in your game. To keep the size of the file reasonable, THE RECOLORS FOR THESE THREE OBJECTS AREN'T INCLUDED (see above). The wallpanels from the crew quarters set are also included here, to complete the wallpanel set. They also appear in the collection file. The wallpanels first made their appearance in the crew quarters set. In this set, I added a floor-height panel to complete the full wall. The runners complement the wall panels and can be mixed and matched with them. The MSD runner is meant as a filler between the backplate and the bottom of the display panels. The status bar is the same height as the full-length runner but uses different textures. The backplates are designed to be placed below consoles or tables and cover the back wall. Egghead stuff: These items have place-anywhere BHAVS and can be stacked on or around occupied tiles. They make bridge building a snap! These are essentially bookends for your MSD. The box the entire unit in nicely. Egghead stuff: These items have place-anywhere BHAVS and can be stacked on or around occupied tiles. The focal point of any MSD is a good graphical interface. Egghead stuff: These items have place-anywhere BHAVS and can be stacked on or around occupied tiles. The 3-tile, 6-panel display is slaved to the 5-tile, 10-panel display. The 3-tile, 2-panel display is slaved to the 5-tile, 4-panel display. The 3-tile, 1-panel display is slaved to the 5-tile, 3-panel display. Functional consoles with logic and mechanical skilling enabled. Egghead stuff: Skill-enabled consoles. The 3-tile, 3-panel console is slaved to the 5-tile, 5-panel console. The 5-tile, 2-panel console and 3-tile, 1-panel console are slaved to the 5-tile, 3-panel console. 5-tile and 3-tile tables. Great for placing an invisible computer. Egghead stuff: Tables. The 5-tile, 5-panel table and 3-tile, 3-panel table are slaved to the 5-tile, 5-panel console. The 5-tile, 3-panel table, 5-tile, 2-panel table and 3-tile, 1-panel table are slaved to the 5-tile, 3-panel console. These are decorative objects that allow the consoles and tables to be used as freestanding objects. The authenticity you have achieved is amazing! And the graphics on the displays, etc. are Stellar! Thank you! My pleasure. This was one of my favorite sets in this series, and really made all the sets after it possible.